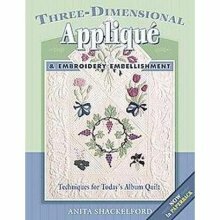 Girls, this book has great ideas on how to embellish applique'! Three-Dimensional Applique' & Embroidery Embellishment by Anita Shackelford (I found it here). I actually used some of its ideas last week when I wanted to embellish one of my applique' blocks. It made such a huge difference!